What were you doing when you were 17? Sitting exams? Learning to drive? Making your debut in the Champions League? Manchester City midfielder Phil Foden accomplished the latter on Wednesday, when he started his side's 2-1 loss to Shakhtar Donetsk. In doing so, aged 17 years and 192 days, he became the youngest Englishman to start a Champions League match, breaking former Chelsea player Josh McEachran's record. 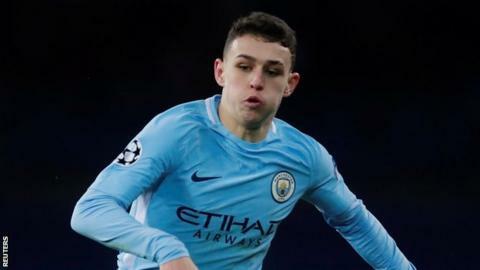 Stockport-born Foden, whose turns 18 on 28 May, is also the first player born in the year 2000 to start a match in Europe's top-level club competition. And this has been quite a year for him - he scored twice in the final as England won the Under-17 World Cup in October, and was named player of the tournament. English teams dominate group stage - but can one win? What happened in the year Foden was born? Current Bournemouth striker Jermain Defoe, 35, scored his first senior goal for West Ham. Manchester United wrapped up their sixth Premier League title. A 26-year-old Kevin Phillips finished the season as Europe's most prolific striker with 30 goals. An England squad featuring David Beckham, Michael Owen and Alan Shearer finished third in their Euro 2000 group. Pep Guardiola, now Foden's club manager, was named in the team of the tournament. The day before Foden was born, England drew 1-1 with Brazil in a friendly. Current England boss Gareth Southgate was on the bench, as was West Brom midfielder Gareth Barry. Roberto di Matteo scored the winner as Chelsea beat Aston Villa in the last FA Cup final at the old Wembley. Manchester City secured promotion back to the top flight with a win at Blackburn.